At 23:22 GMT on Friday June 16th ReVision II is at 8 deg 39 min South and 132 deg 23 mins West. We have 388 miles to go to Fatu Hiva. We are glad to report that normal service has been resumed. For the last few days we have had steady winds, blue skies and rolling seas. It really is wonderful out here - knowing we only have a few more days makes it even better. Our days are lazy again, reading, cooking and doing the occasional tweak to the sails or steering. Yesterday was overtaken by the catching of a fabulous dorada, it was absolutely beautiful, bright blue and yellow and weighed about 15lbs so plenty of fish for the next few days - Andrew seems to have the magic touch when it comes to fishing in the Pacific as many of the other boats we are with have tried for days with nothing. 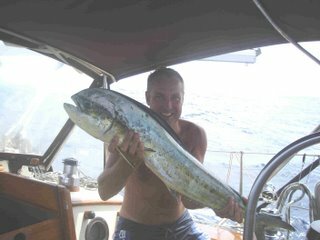 Although 3 boats all caught a fish yesterday. I have taken over net control for the formal radio net in the afternoon, something I never thought I could do but so far so good, I just have to be careful I don't talk to each boat too long as it uses alot of power, it is quite fun and we feel like we are doing our bit. Not to worry, when Scooby was 'let go'! all wrapped up in a foul weather coat! when Scooby returned from the sea! all aboard their Galapagos float! when we all get to the Marquesas on time! Obviously this lot have been at sea too long!! But it did really make Andrew's day - thanks.